President Obama speaks about EPA carbon regulations at an event in the White House. Photo credit: Olivier Douliery/Bloomberg. Unfortunately for every American who uses electricity, President Obama is keeping this promise. After failing to get legislation passed through a Congress controlled entirely by his own party, President Obama turned to EPA to impose carbon regulations. Based on some creative reading of the Clean Air Act, it came up with the Clean Power Plan. The final version calls for a 32% cut in carbon emissions from power plants by 2030. This is more drastic than the 30% cuts found in the draft released in 2014. Under the plan, EPA will set carbon emissions goals for each state. By 2018 states must submit plans on how each will cut carbon emissions to EPA and meet their first targets by 2022. Should states refuse to submit plans—Indiana’s Mike Pence and Oklahoma’s Mary Fallin have announced their state won’t--or miss the deadline, EPA will impose a plan on them. What should we expect from EPA’s power grab? To get a sense, look at California, the Northeast, and Germany. Despite projections of imminent cost-competitiveness with fossil fuels, renewable generation continues to be considerably more expensive. During 2003-2013, overall average cost of renewable generation acquired by the aforementioned utilities rose by 55 percent, from $54/MWh to $84/MWh. In contrast, in 2013, the average wholesale market price of generation was slightly more than $46/MWh. In 2012, nearly 1 million households spent more than 10 percent of their income on energy bills. In hotter, less affluent inland counties, the rate of energy poverty was as high as 15 percent of households. Moving east, we see that the New England states and New York are part of a carbon emission cap-and-trading scheme that squeezed out cheaper coal-generated electricity. It’s not surprising that these states have some of the highest electricity prices in the U.S., as this Institute for 21st Century Energy map shows. Let’s cross the Atlantic to Europe. Germany has been undergoing the Energiewende, a nationwide policy of embracing solar and wind, while shunning coal power, and abandoning nuclear power. This has been a costly transition. 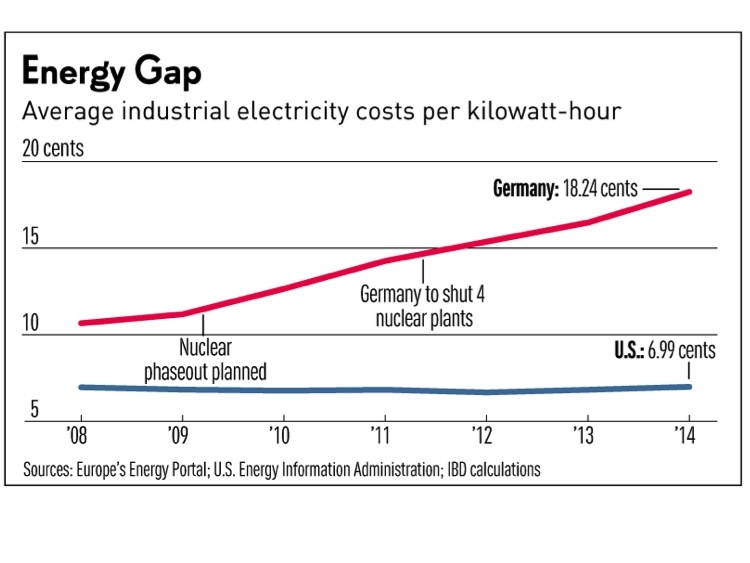 As the chart below shows, Germany’s electricity rates, already double that of the U.S. in 2008, have continued to rise. Already, BASF has doubled its annual investment in the United States to about $1 billion a year. With its French partner Total, it recently completed an estimated $400 million expansion and upgrade of their petrochemical plant in Port Arthur, Tex., which employs about 250 people. “We shift investment money from Europe into the U.S. as a consequence of the less competitive environment in Europe,” Harald Schwager, a senior member of BASF’s executive board, said in an interview here. Over the next five years, BASF plans to pump a quarter of its planned €20 billion in investments into North America. For the first time, the company plans to trim its spending in Germany from its traditional level of at least a third of investment to only a quarter. Right now, low-cost electricity makes the U.S. more globally competitive. By raising electricity prices, EPA’s carbon regulations will shrink this competitive advantage. The EPA's effort to shut down existing power plants and thus drive up energy prices for businesses and consumers alike will inflict significant damage to our entire economy and reduce our nation’s global competitiveness without any significant reduction in global greenhouse gas emissions. It is a bad deal for America, and we will pursue all available options, including litigation if necessary, to block EPA's regulatory power grab from taking effect. As for President Obama, should the plan withstand an expected lengthy legal fight, he’ll be out of office by the time higher electricity prices impose a heavy weight on the economy. The National Rural Electric Cooperative Association published a map showing all the power plants affected by EPA’s carbon regulations. 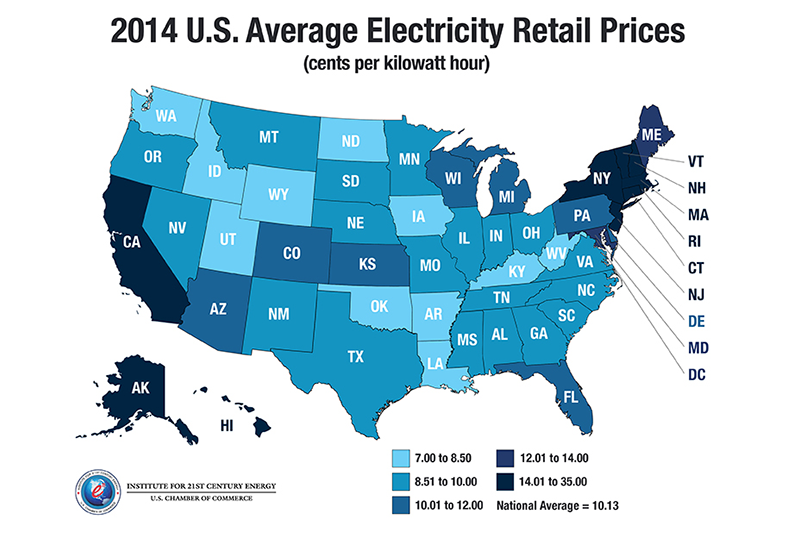 The Washington Post published a set of maps showing how the U.S. gets its electricity.